I managed to take a handful of pictures while at PAX. Most were of the demo sessions that I was running but, there are a few other interesting photos mixed in. As you can see, there were a number of demos and games over both days. There was lots of neat stuff brought by other people. 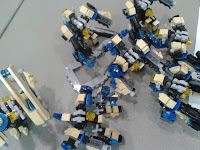 I haven't checked Flickr in a couple of days but, I haven't seen any MFZ pictures from the con. 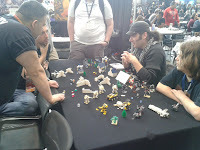 If you know of any PAX photos of MFZ let me know. I talked to several people at PAX East who asked, "How do I start building?" When I first started playing Mechaton -- yes, Mechaton, I've been around that long :-) -- I started by buying a couple of sets and a bunch of bricks from the Pick-A-Brick wall and putting together some stuff that I thought looked neat. Then I started copying things that I found instructions for online. Then I just copied things I saw online. 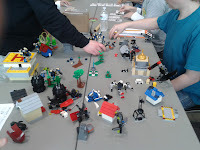 Then I started dumping pieces from sets out in a big pile and trying random connections while sorting. Occasionally I pick a random piece and try to build a mech around it, or using it somewhere in the build. 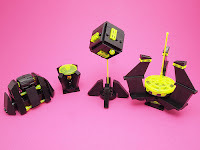 If you're new to building things with Lego, don't be afraid of building simple things and discovering how the pieces connect. Appreciate the things you see online from experienced builders but don't be intimidated. Everyone had to start somewhere. Just like any other skill Lego building improves with experience. You build a library of techniques over time. Keep building. Do it as much as you can. Practice makes perfect. 1.) My voice was still a little raw on Monday morning from all the talking I did over the weekend. 2.) Next year I'm going to attend for all three days of the con. One day will be simply walking around and enjoying the con. 3.) There were a lot less people mentioning they had backed the Kickstarter this year. Last year it felt like every other person I talked to mentioned the Kickstarter. This year it was just a handful. 4.) 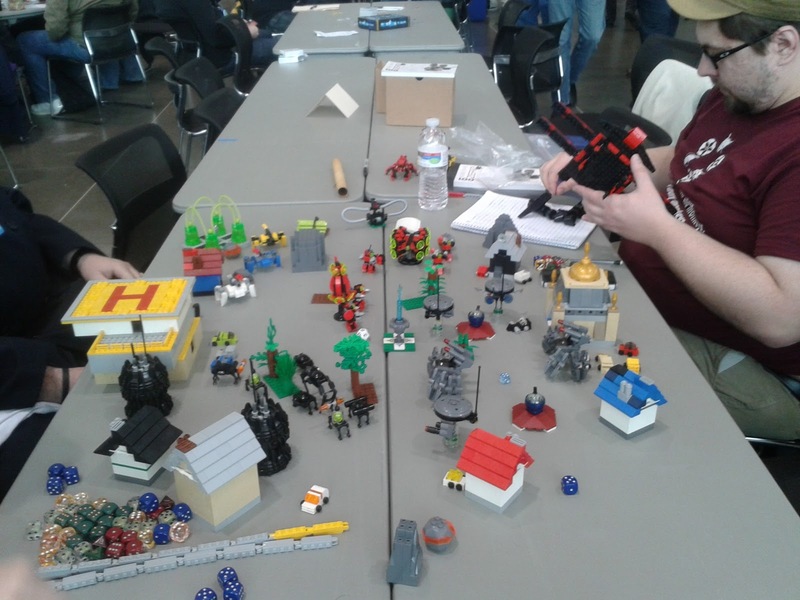 There were a lot of people who saw the game that mentioned liking mecha and Lego. 5.) I did not get a chance to explore the con this year. 6.) 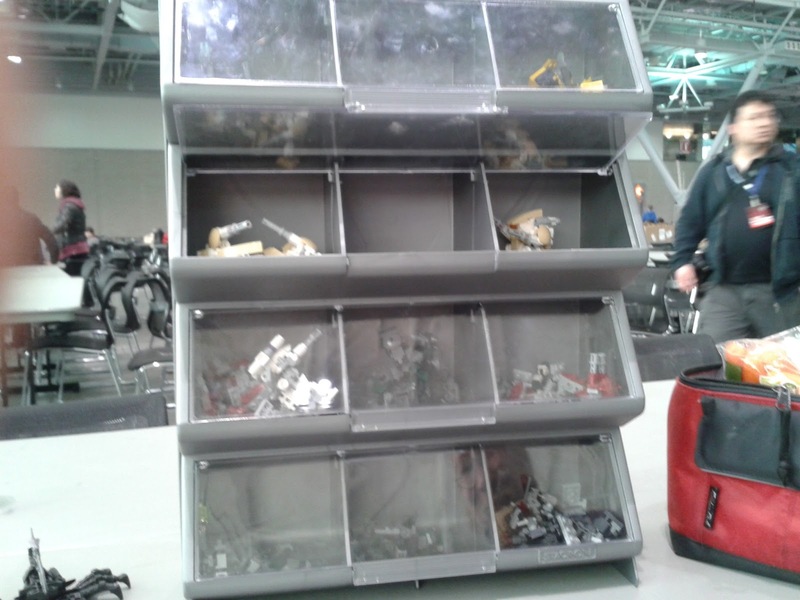 I did see lots of neat mechs from Vincent and Sebastian though. 7.) I did not get to talk to Vincent and Joshua as much as I'd have liked. 8.) I didn't see Jerry Holkins, "Tycho", this year. I have no idea if he stopped by the booth at all. Which is a shame as I had a couple of comics I wanted him to sign. 9.) 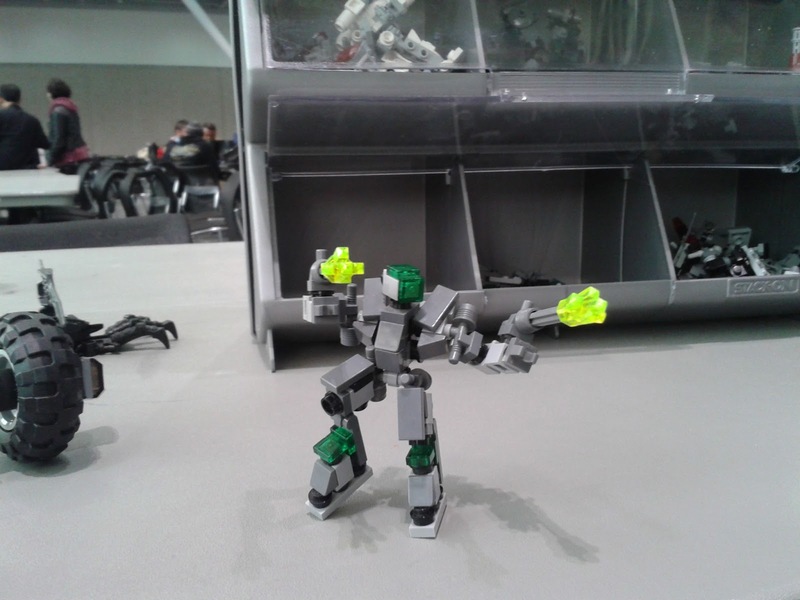 I'm not seeing any MFZ photos from the con on Flickr which is really disappointing. 10.) I should get business cards printed up so I can tell people about the blog and MFZ. 11.) I really need to get the problems with the Hangar sorted so I can tell people to go there and register. 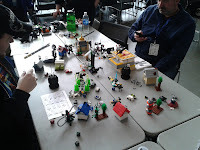 We really need a central "meeting house" for the MFZ community and right now the one we have is faulty. I know it's one of the Five Geek Social Fallacies to want to include everyone, BUT, I really want to share this thing I love with other people who seem to share this interest and who want to join in the fun. 12.) I really need to come up with a short form scenario and squad compositions so I can run short demos for people who don't have time for a full game. 13.) I need to find a better cheat sheet for demoing. The one I use currently was designed for Mechaton and the way I fill it out is a little confusing for people who are not me. There are a lot of Lego sales going on this week. Target, Toys'R'Us, Kmart, and Lego all have some sort of sale or promotion running. The Lego one features several Legend of Chima sets and Double VIP points. The Toy'R'Us sale is a BOGO50% and 30% off select sets. Kmart has a 15% off on all TMNT, Chima, and City sets. 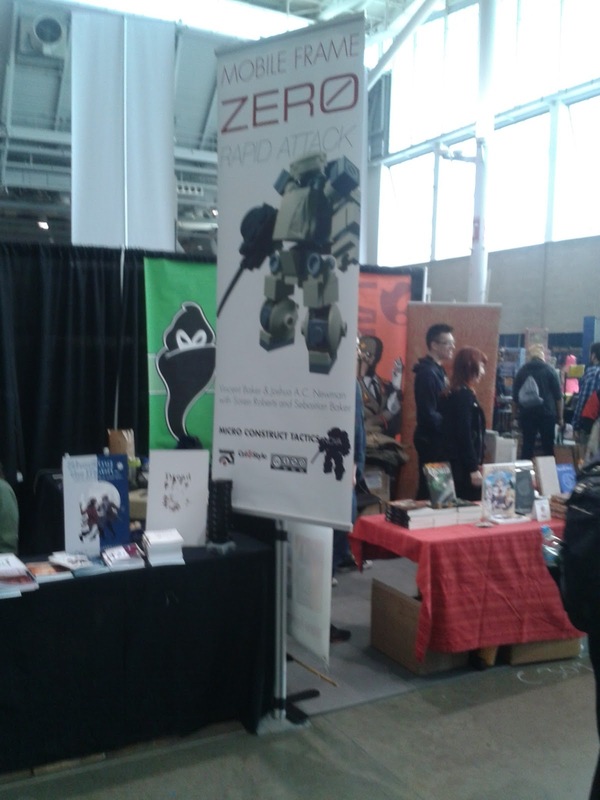 Once again, I will report that PAX East is awesome. I actually attended two days this time around. I was there for eight hours on Saturday and four hours on Sunday. Saturday: I arrived a little late -- 10am -- due to the Silver line running slow. I spent the first hour or so re-assembling most of my squads and stations as I had to run and catch the Green line for the first leg of my trip. 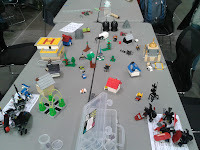 Which led to my Lego bouncing around inside my bag and turning into a pile of random parts. Sometime between 11:00 and 12:00 things picked up with people stopping by and asking to try the game. I ran three short demos back to back. This lasted 'til maybe 2:00. Then we managed to start up a full game with four people. Let me say, a game with four people on the tables we were using was claustrophobic. I much prefer the round table we were using last year. The tables this year weren't as heavy as the round table we used last year so they moved if you leaned into them. That game played out over the next couple of hours. I was lucky to have an experienced player at the table and he helped to move things along. It also allowed me to talk to passers-by who had questions. After that I ran another demo for four people. Later I transitioned into another game for six (!) people. Luckily they were split into three teams of two. That was the last demo I ran for the day. Sunday: I got in a little after 2:00. This was planned as I wanted some time to recover and relax in the morning. I met a friend and we talked for a bit before I grabbed my kit from the both and found an empty table. When I grabbed my kit I ran into someone looking for a demo. Between my friend and myself we got the table set up pretty quickly. 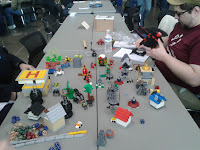 Teams were chosen and the battle joined. It lasted three rounds before the gentlemen had to go. Luckily a trio of young kids had come along looking to play. 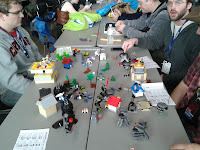 We hit the reset button, the kids chose teams and we went to battle again. One of the kids had to leave right after we started but the other two stayed right to the end. They even gave impromptu names to the mechs in their squad! I really hope they picked up a copy of the rules. This was the last game of the day for me. It was a shame because the kids came back for another try. I got to meet a lot of cool people this year, among them a couple of people from the Mobile Frame Hangar. I did take some photos with my smartphone so those will be posted later in the week. Looking through his Flickr stream it looks like he's more known for his spaceships than his mecha. 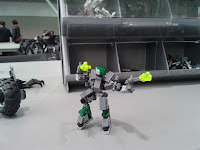 But I've found a few that are about the right scale for MFZ. Robots Just Want to Have Fun. This last one isn't a mecha. 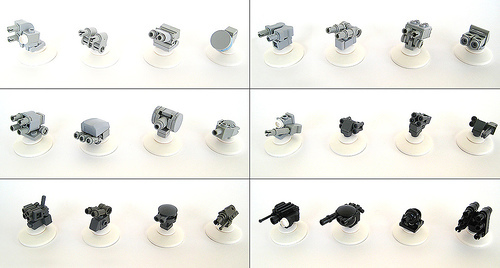 But some of the turrets in this picture may work as heads for mecha. There have been some really good themed stations posted recently. Let's take a look at some of them. These from dark_syntax are excellent. Free Colonies Stations by dark_syntax. These from milt69466 are good. 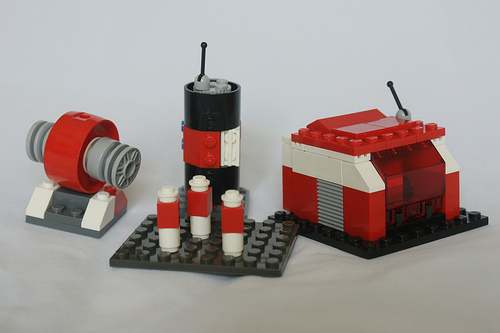 Red Guild Stations by milt69466. And these from LowestFormofWit are outstandng. Dissident Stations by LowestFormof Wit. I'm posting this under the "Tablescrap" heading because it's not quite finished. But, honestly, I think this has gone way beyond a tablescrap. Mobile Frame Hangar discussion thread. The Block Chest design started with this version. I wasn't exactly happy with the way it looked and the one stud connection from the chest to the waist was way too fragile. I did like the way the legs looked though. So I worked a bit more and it became this. It has the same essential shape, just smaller. He has a brother. Here are a few specialized versions. 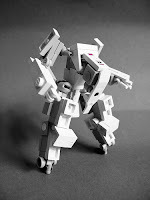 This is another picture of the first Block Chest mech in a more limber pose. You can see it's a fun little frame that can be modified into multiple variants. I should have a few more pictures to share with you soon. One of the items that gets used in every game but does not get talked about very much are dice. There are ways of getting a large amount of cheap dice. Like the game Tenzi. This game features four sets of ten dice in colors that can be used in MFZ. It was brought to my attention by Otami N71. Then there are specialty dice. 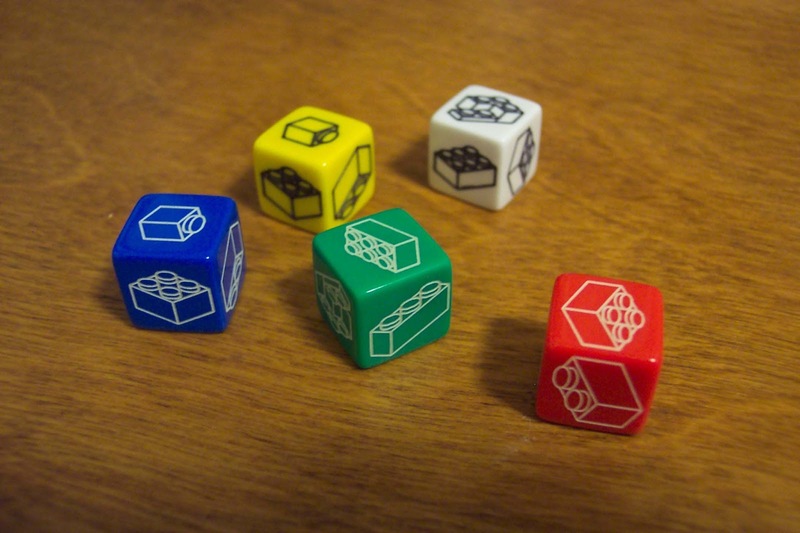 Such as these Lego dice by Eric Harshbarger. These were brought to my attention by Daniele Grillezoni on Google+. There are other specialty dice that I like. Such as the Q-Workshop Cyber Dice and the Q-Workshop Chip Dice. There is one major problem with specialty dice though, no matching d8s. 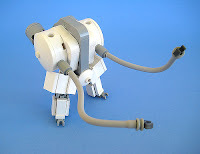 A couple of the other MFZ bloggers have discussed Micah Bauer's Component 6 System but I think it deserves another visit. Especially since we will probably have an influx of new players after the rulebook becomes widely available in print. The core concept behind the C6 System is that it uses six commonly available parts that are easy to acquire in bulk. 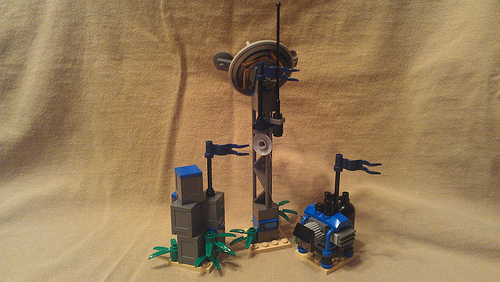 These parts are also common enough that they can be found in older sets and collections. This design philosophy also neatly sidesteps the question of, "Do I use Travis Bricks, Pneuma-Ts, and/or Taps?" Which makes every C6 design an entrant in the MittenNinja's 3T Challenge. He's built a lot more things using the C6 design philosophy since the first flurry he posted to Flickr. He now has a station and vehicles/scenery to go along with the initial frames. 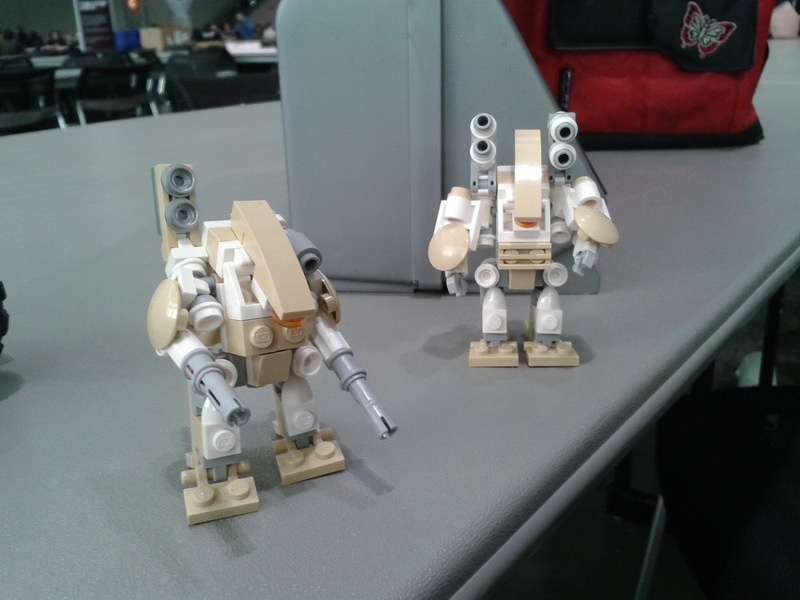 I built a mech using the C6 System. for a total of 31 pieces. Right now I'm running with 2Rd/1G/2W for stats. Here's another interview with Joshua A.C. Newman. 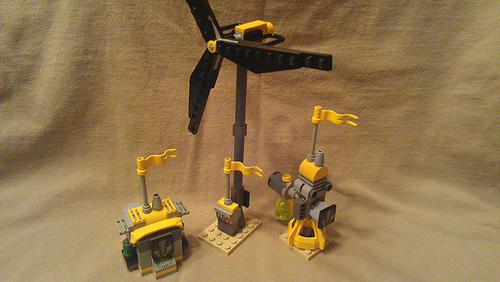 This one covers more than just MFZ though. Stumbling around on the Kre-O website has yielded some unexpected fruit. Apparently you can order replacement parts. 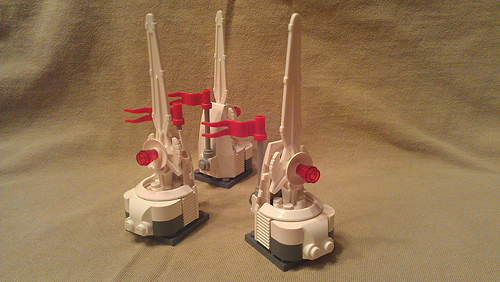 Here's the ones from the Battleship: Alien Strike set as an example. 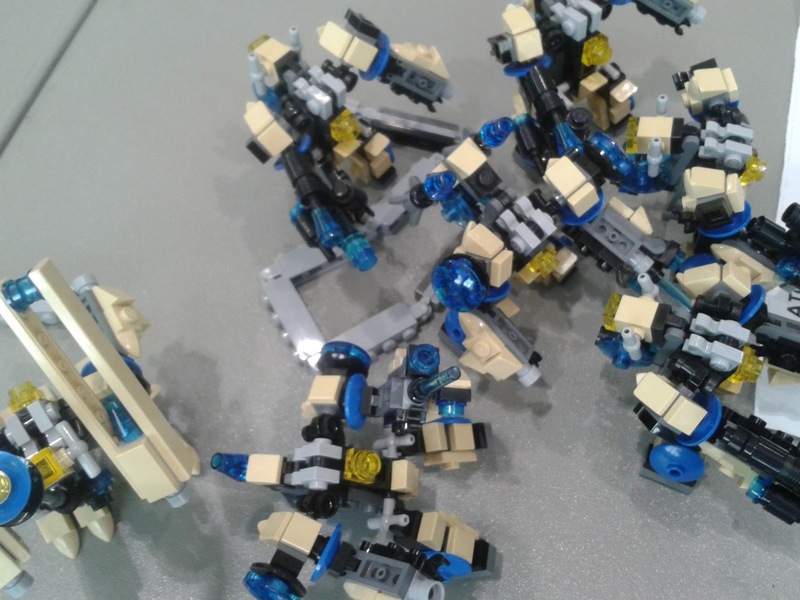 I'm not sure what the parts or shipping cost may be but, this may be a way to sidestep buying entire sets and just procure the interesting -- and unique to Kre-O -- pieces you want. Which is kinda funny since I was lamenting, to myself, the lack of a Bricklink-type site dedicated to Kre-O pieces. Once again I'll be helping Vincent, Joshua, and the others demo Mobile Frame Zero. I'm definitely going to be there Saturday (3/23). Right now I'm trying to figure out if I can make Sunday (3/24) too. Here's a discussion thread over on the Hangar if you're interested on meeting up.